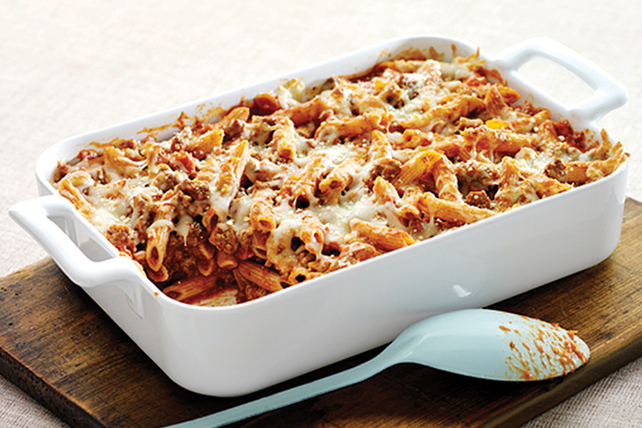 This best-loved pasta bake is a great way to incorporate whole grains into your family's diet. Brown meat in large skillet; drain. Add pasta, sauce and Parmesan; mix well. Spoon into 13x9-inch baking dish; top with mozzarella. Substitute 250 g (2/3 of 375-g pkg.) broken whole wheat spaghetti for the penne pasta. Brown meat with 1 tsp. Italian seasoning and 3 minced garlic cloves. Store ground beef in the coldest part of the refrigerator for up to 2 days. (The refrigerator temperature should be no higher than 40°F.) For longer storage, wrap the meat tightly in foil or freezer-weight plastic wrap and store in the freezer. When thawing, place the meat on the bottom shelf of the refrigerator to prevent any drippings from cross-contaminating other foods. Up your calcium intake with a serving of this quick-and-easy recipe. The mozzarella provides a good source of calcium per serving.